A flame grilled beef burger topped with bacon in a sesame seeded bun, with a processed cheese slice and a sachet of Rustlers sauce. Follow us on Facebook and Twitter for the latest news. The go-to topping for any burger fanatic. Flame grilled beef, succulent back bacon and melted cheese all covered in Rustlers sauce that delivers a full-on satisfying feast. Definitely not a burger for sharing. 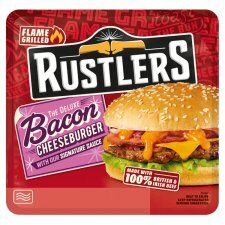 Rustlers are a range of tasty, genuine flame grilled burgers and hot sandwiches which can be enjoyed straight from the microwave. From ensuring each product is fully traceable to the farm of origin, to developing a range of signature sauces to complement each product, Rustlers go the extra mile to stay on top of the game; continually testing and refining its products to ensure you are getting the best taste, always. Although great care has been taken to remove all bone some may remain. Make it your own by adding your favourite toppings. Why not try some crunchy lettuce, red onion, sliced tomato or even a spicy addition! If you have any comments, give us a shout and let us know! Remember to keep the packaging in case we ask for it. Keep in the fridge, and don't freeze. Remove burger from packaging. Stick in the microwave and heat on full power. Add the cheese slice for the perfect melt, squeeze over our signature sauce, then enjoy! 1. 800W: 1 minute 50 seconds. 2. Leave to stand 30 seconds. Or for the perfect bun, heat burger & bacon on full power reducing the cooking time by 20 seconds & toast bun!